Every electrician knows that staying alert is a top priority when working with electricity. One slip up when working with electrical elements can be fatal. That’s why we at Henderson Electric of NWF take safety so seriously. We expect our highly trained and certified employees to conduct safe, reliable work at your home or business and in our shop. We regularly conduct trainings and remind our staff of the dangers on job sites and the importance of being safe. One sobering fact from the Bureau of Labor Statistics — electricians account for about seven percent of total deaths in the building trades. Construction sites account for the overall majority of electrical related deaths. We at Henderson Electric constantly address safety with all of our team, whether they change a light bulb or upgrade an electrical panel. The electrical current in homes and businesses can be hazardous. It’s critical to your safety and ours that these practices are followed. Always assume wires that are overhead or that have fallen to the ground have lethal voltages and remain unsafe to touch. Call the utility company to report downed electrical lines. Remain at least 10 feet away from any overhead wires you see when surveying the area. Never operate electrical equipment, while standing in water. If working in a damp environment, inspect electric cords and equipment to ensure they work properly. Make sure to use a ground-faulty circuit interrupter (GFCI) that can detect any current and immediately cut off power. Only repair electrical cords or equipment if qualified to do so. Use ladders made of fiberglass or another material that will not conduct electricity. In case of an emergency, know where the electrical panel and circuit breakers can be found. Each breaker should be labeled clearly to which rooms or appliances it powers. Disconnect power first, in case of an electrical accident. Insulation or guarding of energized parts to block an employee or customer from coming in contact with them. 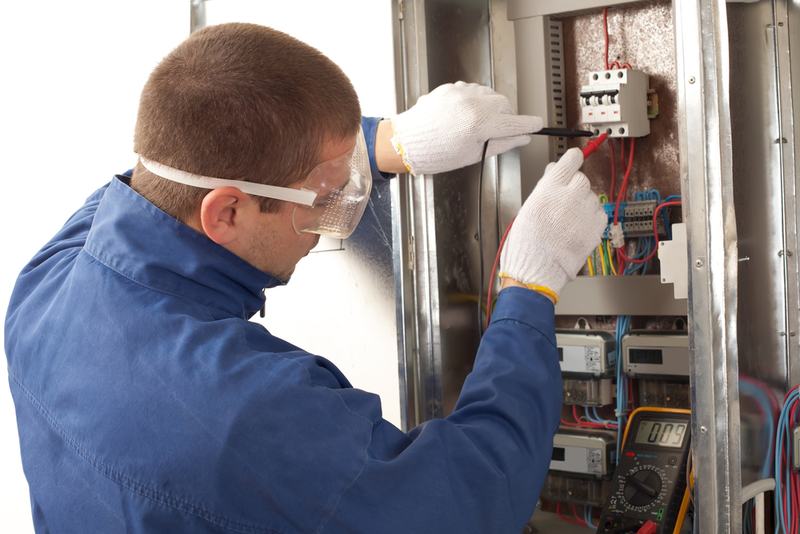 We have a skilled team of electricians that prioritize safety standards, making for more efficient and successful completion of projects at your home or business. We take very seriously the electrical safety of both our customers and employees. Call us today to make sure the job gets done safely and right the first time.